First thing that I definitely must do is make a backup. 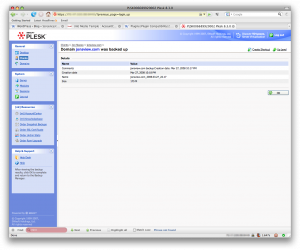 To be safe I have Plesk perform a full backup on my domain but just to be extra safe I dump my wordpress and mint databases to my local computer for safe keeping. Back to firefox now, it’s time to upgrade the database. And I’m presented with the new login! And everything is back up and running (10:34 PM). That’s it! 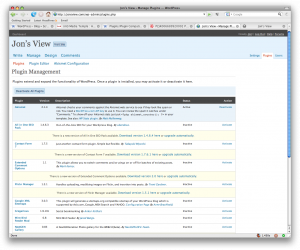 Jon’s View is now running WordPress 2.5 with only 4 minutes of visible down time. 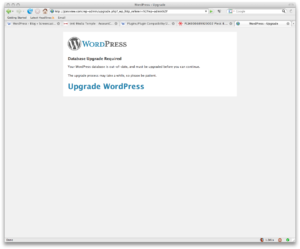 I forgot to disable the plugins before doing the upgrade but fortunately WP 2.5 has taken care of that by disabling any non-compatible plugins. So all that’s left is to update to compatible plugins and remove those I don’t use anymore. 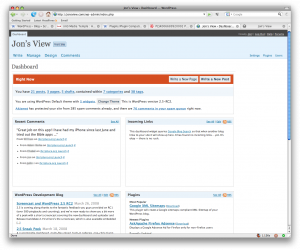 I’ve been meaning to clean out some of the cruft that I’ve collected since I installed. Of course there are still a few bugs and limitations but they have only been cosmetic up to this point with available workarounds. So all in all I am very excited with this new version.